Description: After defeat at Bristoe Station and an aborted advance on Centreville, Stuart’s cavalry shielded the withdrawal of Lee’s army from the vicinity of Manassas Junction. The Battle of Buckland Mills, also known as The Buckland Races or Chestnut Hill, was fought on October 19, 1863, between Union and Confederate forces in the American Civil War. Union cavalry led by Brig. Gen. Judson Kilpatrick were caught in a Confederate ambush and defeated. Near Buckland Mills, on Broad Run, Confederate cavalry commander Maj. Gen. J.E.B. 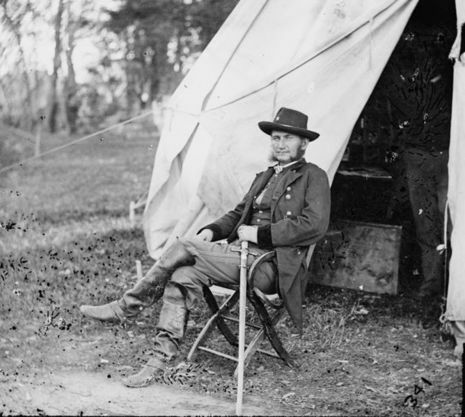 Stuart, with Maj. Gen. Wade Hampton's cavalry division, were covering Gen. Robert E. Lee's retirement from his defeat at Bristoe to the Rappahannock River. On October 19, they turned on Kilpatrick's pursuing Federal cavalry, while Maj. Gen. Fitzhugh Lee's division charged the Federal flank. Kilpatrick was routed, fleeing five miles to Haymarket and Gainesville. The Confederates derisively called the affair "The Buckland Races," although some Confederate commanders likened it to a fox hunt.